The criminal court has sentenced a 46-year-old man to life in jail and handed a MVR100,000 fine over one kilogram of cannabis. Ali Imran, of Coconut House in Malé, was caught with 1131.2 grams of cannabis in November 2012. Police apprehended Imran at Malé’s commercial harbour for suspicious behaviour and found the drugs hidden under the seat of his motorcycle. At the time, police had received information a cargo boat traveling from India was carrying illicit drugs. When Imran’s house was searched, police found MVR134,050, US$2200 and 21 diamond stones and four precious stones inside a safe. He had another MVR461,948.26 in an HSBC account. The criminal court has ordered the state to confiscate the money and the precious stones, stating Imran had not explained how he had obtained the money. A sniffer dog has located 300 grams of heroin in the Maldives’ first drug raid involving dogs. The police, with the dog’s help, managed to recover two packets of what they say was a major stash of drugs at a private residence in Malé on Saturday night, after suspects flushed an unknown quantity of illegal drugs down the toilet. Police estimate the street value of confiscated heroin at MVR600,000 (US$39,063). A 26-year-old from Gaaf Dhaal Thinadhoo was arrested from Carnation Lodge. Dogs are illegal in the Maldives for religious reasons, but home minister Umar Naseer last month brought in 16 puppies from the Netherlands to tackle the Maldives’ entrenched drug abuse and trafficking problem. Local media reported a woman at the scene fainted on seeing the dog, but police say they believe the woman had fainted after seeing the narcotics at her home. “These are false reports, we believe she fainted after the drugs were discovered, not because she saw the dogs,” Shifan said. He said the police will not use the dogs to incite fear among the public. The dog squad reportedly cost the government US$40,000. Custom-made kennels have been established at the airport, and the government has brought in British and Dutch trainers to train police officers on working with the dogs. Police were only authorised to use sniffer dogs in operations on Thursday. Shifan said the dogs will also be used to detect counterfeit money. Last year, the police confiscated 44 kilograms of drugs in 31 nation-wide operations. President Abdulla Yameen yesterday ratified amendments passed by parliament to the Clemency Act and Human Rights Commission of Maldives (HRCM) Act last month. Amendments submitted on behalf of the government to the HRCM Act were among a number of bills drafted by the Attorney General’s Office to bring outdated laws in line with the Constitution adopted in August 2008. The amendments confer powers to the HRCM to either suspend employees of state institutions for two weeks for not complying with the commission’s orders, or to impose a fine of between MVR3,000 (US$195) and MVR25,000 (US$1,621) for non-compliance. Amendments submitted by Progressive Party of Maldives (PPM) MP Ahmed Thoriq to the Clemency Act meanwhile state that convicts would be eligible for presidential pardon or reduction of sentences after serving one-quarter of a jail term. The period is currently one-third of a sentence. Moreover, persons convicted of drug trafficking involving less than 14 grams would also be eligible for pardon or commuting of sentences. Amendments to the Clemency Act submitted by Progressive Party of Maldives (PPM) MP Ahmed Thoriq was accepted for consideration at today’s sitting of parliament. Following preliminary debate, MPs voted unanimously to send the amendment bill (Dhivehi) to the national security committee for further review with 62 votes in favour. According to Thoriq’s amendments, convicts would be eligible for presidential pardon or reduction of sentences after serving one-fourth of a jail term. The period is currently one-third of a sentence. Thoriq also proposed adding drug trafficking to crimes for which convicts would not be eligible for pardon. The Maldives Police Service (MPS) and the Criminal Court have blamed each other for the release yesterday (October 3) of two suspects arrested on charges of drug trafficking. The two suspects were taken into custody on Thursday (October 2) after about 1kg of drugs were found in their possession. The pair were reportedly arrested after they loaded a vegetable box containing the drugs into a car upon arriving in Malé from the airport. According to local media, the suspects were released because they could not be brought before a judge for extension of remand detention 24 hours after the arrest. The justice building was closed when police took the suspects to the Criminal Court on Friday and the 24-hour period elapsed at 1:30pm. Under Article 48 of the Constitution, judges must determine the validity of detention with 24 hours of an arrest and decide whether or not to authorise pre-trial detention. An official from the Criminal Court’s told local media that police were informed in writing that the court would open at 2:00pm on Friday. If police were aware that 24 hours would elapse before then, the official said police should have brought the suspects to the court on Thursday. Aside from confirming the release of the suspects, police have declined to comment on the incident. Convicted drug trafficker Ibrahim Shafaz Abdul Razzak has appealed his drug trafficking charges at the High Court, reports local media. At the first hearing yesterday, Shafaz’s lawyer argued that the trial at the Criminal Court was conducted in a prejudiced and unfair manner. 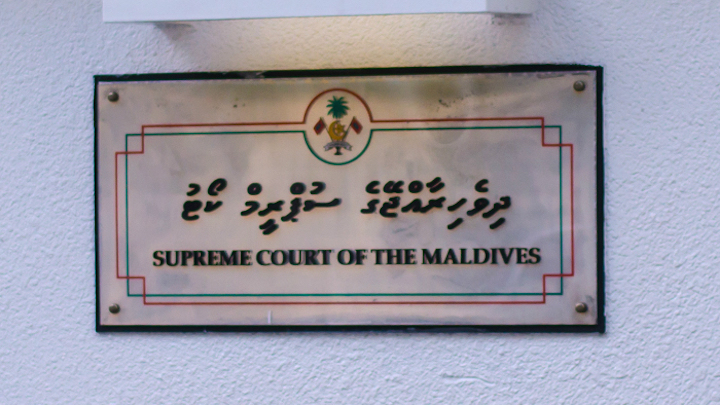 The defence attorney, Aminath Shezleen, noted that the verdict did not specify the type of drugs Shafaz was accused of trafficking with reference to the appendix of the Drugs Act. While the conviction was based on a phone call recording, Shezleen said the audio was submitted as evidence without a chain of custody report from police as required by regulations. The state attorney, however, defended the validity of the report and noted that both sides were allowed to question experts at the trial concerning the analysis report of the phone recording, adding that Shafaz had not denied that it was his voice in the incriminating audio. Concluding the hearing, the three-judge panel asked for submission of both the chain of custody report and the recording of the phone conversation. The judges announced that a second hearing would be held after considering the evidence. The Criminal Court had sentenced the 30-year-old to 18 years in prison in November 2013 and levied a fine of MVR75,000 (US$4,860) for drug trafficking. In February, Shafaz was temporarily released for three months to seek medical treatment said to be unavailable in the Maldives. However, following media reports suggesting the Maldives Correctional Services (MCS) violated procedures in authorising his release, Shafaz was caught in Colombo in May and brought back to the Maldives to serve his sentence. Shafaz was arrested on June 24, 2011, with 896 grams of heroin from a rented apartment in a building owned by ruling Progressive Party of the Maldives MP Ahmed ‘Redwave’ Saleem. Former head of the Drug Enforcement Department, Superintendent Mohamed Jinah, told the press at the time that police had raided Henveiru Fashan based on intelligence information gathered in the two-year long ‘Operation Challenge’. Jinah labeled Shafaz a high-profile drug dealer suspected of smuggling and supplying drugs since 2006. He claimed that the network had smuggled drugs worth MVR1.3 million (US$84,306) to the Maldives between February and April 2011. The restriction of the home minister’s prerogative to order individual police officers has not affected police effort’s to combat gang violence, Home Minister Umar Naseer insisted in parliament today. Appearing for minister’s question time, Naseer explained that the home minister could no longer issue direct orders to police officers due to “changes” made to his mandate by President Abdulla Yameen, who exercised “his discretion under the law”. “However, there has been no change to the role of police in this country. Police are fulfilling their responsibilities and will continue to do so,” Naseer insisted, adding that “special measures” were being taken to ensure security in the capital Malé. The opposition Maldivian Democratic Party (MDP) alleged yesterday that “the present climate of fear in Malé and several islands began to escalate following [Naseer’s] constitutional powers as the minister in charge of police being reduced”. Local daily Haveeru reported last week that President Yameen’s decision to reduce the home minister’s powers came after Naseer ordered police officers to investigate Tourism Minister Ahmed Adeeb – deputy leader of the ruling Progressive Party of Maldives (PPM) – for alleged unlawful activities. Contrary to Naseer’s remarks today, President’s Office Spokesperson Ibrahim Muaz Ali had denied any changes to the home minister’s mandate. Naseer meanwhile told MPs today that a “special police operation” was ongoing to curb gang violence in the capital following a spate of violent assaults during the past six days. Naseer suggested that the problem was exacerbated by insufficient police resources, revisions required for “some laws”, and drug trafficking. Crime in the Maldives stemmed from drug use, Naseer said, adding that efforts to combat drug trafficking have increased “manifold” under the current administration. Efforts were currently underway to renovate and upgrade the rehabilitation centre in Himmafushi, he noted. The government would continue “supply reduction” and “harm reduction” efforts, he added, reiterating that a period of 15 years would be needed with a “sustained effort” by successive administrations to address the country’s drug problem. Asked by PPM MP Ahmed Nihan if there was any intelligence information suggesting that opposition politicians were behind the gang violence in a “deliberate attempt to incite unrest”, Naseer said he could not share confidential information at “an open forum”. “But I would say that it is likely that scheming by some people might be involved in what’s going on now,” he said. Naseer was summoned to the People’s Majlis today after a question was tabled by MDP MP Eva Abdulla concerning his allegations made in the wake of losing the PPM presidential primary to Yameen in March 2013. Naseer had contended that the election was “rigged” and alleged that criminal gangs, convicts and drug smuggling “networks” were part of Yameen’s campaign team. The PPM subsequently expelled Naseer from the party after he refused to apologise. Asked how far any investigation of the president’s links to gangs and drug trafficking had progressed, Naseer said he was not legally obliged to answer the question as the remarks preceded his appointment as home minister and was not related to his present duties. Naseer had previously retracted the allegations and categorically asserted that there were no links between Yameen and criminal enterprises. In an interview with Minivan News in January, Naseer had dismissed the allegation as “political rhetoric” borrowed from the MDP. Moreover, in April, Naseer told state broadcaster Television Maldives that he was “not a political threat” to Yameen. At today’s sitting, Naseer repeatedly alleged that former President Mohamed Nasheed encouraged drug use and had resigned in “a state of intoxication”. Nasheed would test positive for drug use “even if his urine is tested right now,” Naseer said. Moreover, Nasheed was responsible for attacks against police officers and their families following the transfer of power in February 2012, he claimed. In followup questions, MDP MPs suggested that Naseer could not answer truthfully for fear of losing his job. MDP MP Imthiyaz Fahmy meanwhile argued that Naseer by his own admission must have been lying either in parliament or when he made the allegations against Yameen last year and asked whether he had apologised either to the president or the public. Naseer said he had “nothing to apologise for” and suggested that MDP leaders should apologise for causing MVR200 million worth of damage by allegedly setting fire to police stations, vehicles and courts on February 8, 2012. Asked by an irate MP ‘Reeko’ Moosa Manik – former MDP chairperson – if provoking the main opposition party was part of his mandate, Naseer said he was “responding in kind” to MDP MPs’ “pestering” questions. The deputy speaker advised Naseer to show more respect to a party with the support of over 105,000 people. Criminal records of more than 2,000 youth have been cleared or expunged since the current administration took office in November, Home Minister Umar Naseer told parliament last week. Appearing for minister’s question time at Wednesday’s sitting of parliament, Naseer explained that criminal records are cleared for suspects involved in cases that are not forwarded for prosecution following investigation by police. Criminal records would not be cleared for suspects whose cases are sent to the Prosecutor General’s (PG) Office, he added. “So we are following that rule now and the number of youth with criminal records will be fewer than before now,” he said. However, Naseer stressed that the Home Ministry could not expunge all criminal records as “this involves employers’ rights as well”. Employers needed to “know who they are giving a job to,” Naseer said. The home minister was responding to a question from Progressive Party of Maldives (PPM) MP for Addu Feydhoo, Ibrahim Didi, who said he received a lot of calls from young people in his constituency who were unable to get jobs due to criminal records. Most of the youth had criminal records for minor offences, he said. In January, police revealed that records of 1,023 persons arrested for various offences were cleared under an initiative to provide job opportunities to youth. A 2012 report on gang culture in the Maldives noted that lack of employment opportunities was one of the main reasons young people join criminal gangs. Criminal records even for minor offences are not cleared for five years, the report noted. Meanwhile, in April, President Abdulla Yameen granted clemency to 169 convicts serving jail sentences or under house arrest or banishment following an announcement at a campaign rally in Fuvahmulah. Naseer told Minivan News in the wake of President Yameen’s announcement that the release of inmates would not present any difficulties to ongoing efforts to combat drug trafficking. “It will not be a hindrance because the present Clemency Act prevents serious offenders from being released. Furthermore, this process will be monitored by the Home Ministry,” he said. President Yameen also commuted the sentences of 24 inmates in January while his predecessor Dr Mohamed Waheed released 39 convicts during his last days in office. The “main difficulty” at present for law enforcement was the delay in concluding cases through the criminal justice system, Naseer told MPs. While the role of police was over after sending a case for prosecution, Naseer said cases were often delayed either at the PG’s Office or at court. Asked about efforts to combat drug trafficking, Naseer said he estimated a period of 15 years would be needed with a “sustained effort” by successive administrations to address the country’s drug problem. The police Drug Enforcement Department (DED) has conducted more operations in the past six months than was previously conducted in one year, Naseer claimed. More drugs were also seized in the past six months than previous years, he added. Discussions have taken place “at the technical committee level” with airport operators and customs officials to “seal” all points of entry, Naseer said. In an interview with Minivan News in January, Naseer said that the main target of his ministry for the next five years would be curbing drug-related crimes.